The British are a nation famous (in our own heads) for being animal lovers. 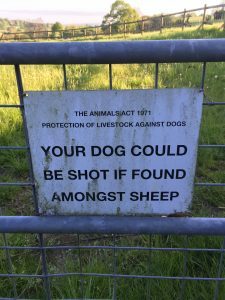 Sometimes this fails us when animals are in competition, as with this touching warning sign, pointing out the dangers of sheep worrying. It reminds me of that question asked by a precocious child on Outnumbered: Who would win in a fight between a rabbit and a sheep?’ I’d like to see that showdown!